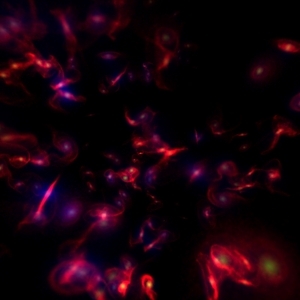 The purpose of the software RealGal is to generate ``realistic'' cosmological movies of galaxies via raytracing, while relying (transparently) on public domain softwares: pov-ray,yorick, mpeg_encode. It makes use of a library of (automatically generated) 3D-icons in df3 format (which can be replaced by user-provided ``improved'' cubes). It also requires knowing (or guessing) the position, luminosity, age and size of the objects. The ray tracing is carried within povray, hence it has the flexibility and limitation of this software. It may run in parallel, using the mpi version of pov-ray. This document describes the main features of RealGal, together with a rapid tutorial a a wish list for future features. It is a component of the HORIZON project, and inherits its copyrights and distribution policy. 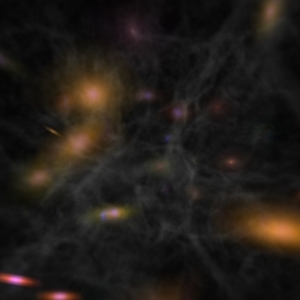 While cosmological simulations provide astronomers with direct estimates of particles, it remains computationnaly expensive to produce realistic snapshots which mimic both the large scale structures and the small galactic scales. Realgal intents to produce ``nice looking'' movies from simple catalogs of points (extracted from simulations). 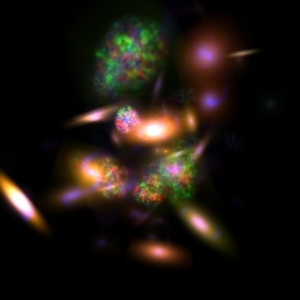 Figure 1: initial density file (a cluster of 10 Mpc extracted from a dark matter simulation) together with the identified adaphop substructures, which are feeded to realgal. The basic principle underlying this software is illustrated in the figure below; our policy is to replace points with properties in a catalog by hyper icons (i.e. 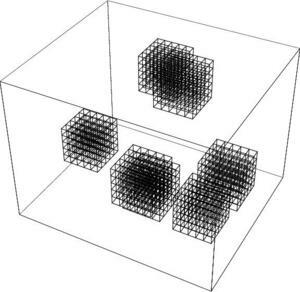 df3 cubes) at the corresponding position with possibly higher resolution (if the hyper icon is close to the camera path) and then rely on povray to do the ray tracing. It implements practically the concept of multiscale raytracing, in the spirit of a static (admitedly somewhat trivial) AMR code. The package can be downloaded as a gziped tar ball; realgal-0.2.tar.gz at the following link realgal ftp://realgal-02.tgz. The package corresponds basically to one script, realgal, which takes at least one input, a catalog or a flag. 5) Edit the first line of realgal so that it points to the yorick binary (itou for adapthop2cat if required). 6) possibly rename the /usr/local/etc/povray.conf file to something else. ???? where <myMovie> and <myCatalog.cat> correspond to your own name for the movie and catalog file (see below, Sec. 1.3). This time the movie file and corresponding files (see below) will be put in $REALGAL/output/<myMovie>/<myMovie>.mpg. to check that everything is working according to expectations. You might want to adapt the global brightness of the film via the brightness flag. 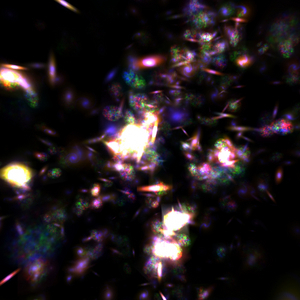 position catalog at a given redshift . 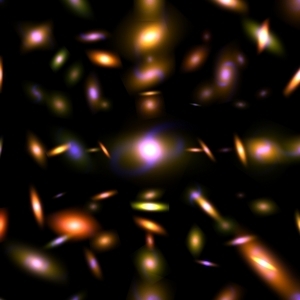 library of galaxies in df3 formats. the travelling file contains a keyword, either fixed or ahead which specifies if the camera should be pointing in front of the travelling or towards a fixed direction. In the latter case, the direction, is given at the end of the file. -h, -help [void] Display the help message. -d, -debug [void] Toggle on debug messages. -v, -verbosity [int] Verbosity level (from 0 to 4). -m, -movie [string] Movie directory name (in output). -c, -catalog [string] Catalog file name. -t, -travelling [string] Travelling file name. -n, -no-display [void] Do not display images during the rendering. 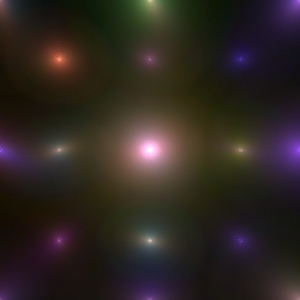 -f, -frames [int] Number of frames (>=12 for movie production). -i, -initial [float] Initial frame (>0 & <=1). -k, -keep [void] Keep images. -s, -size [int] Image size. -q, -quality [sketch, low, med or high] Image quality. -rotation-trav [float, float, float] Travelling rotation. -scale-trav [float] Scale the travelling. -scale-cat [float] Scale the catalog. If 0 willl rescale according to the rms. If negative, only rescales the size of objects. -threshold [float] Distance to the camera after which galaxies are simplified. Figure 4: up: global cluster view; down: close up of the cluster in Fig.1. spiral-ahead.trav: a spiralling travelling pointing ahead. This directory also includes the povray.ini file and the mpeg_encode_ref file which specify the default beheaviour of povray and mpeg_encode respectively. Travelling with splines for viewpoint and opening angle. Realistic colors: realistic filters à la image_maker. Add halo ? and subclumps. modify the script so that everything is relative to "$REALGAL"? replace export to mpeg_encode with yorick mpeg implementation ? Figure 6: exemple of possible diffuse component, mixed with catalog objects. The nodisplay flag is disfunctionnal. The retain images flag is mandatory. 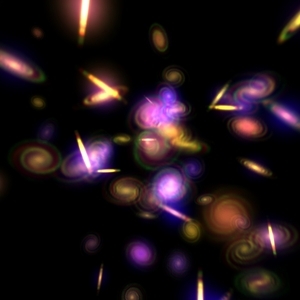 If more than 256 galaxies lay along the same line of sight, this cause povray to crash. 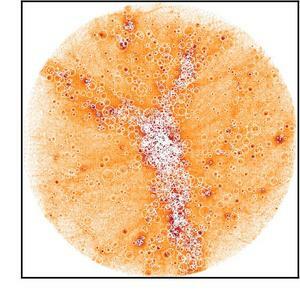 This can be dealt with by reducing the size of galaxies when the field becomes too crowded. The underlying engine behind RealGal is yorick, an interpreter, and as such realgal can also be used directly via yorick for those so inclined (in fact the authors strongly recommand yorick as a very versatile scientific tool). Look at lib/yorick/realgal.i to discover the underlying yorick functions, described briefly in appendix A, starting with MakeMovie. We also provide for the script, adapthop2cat which converts adapthop node files into catalog input files for realgal. 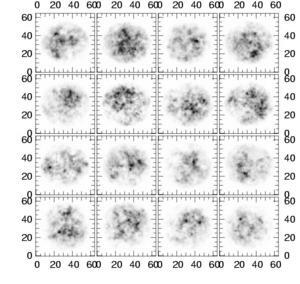 Note that adapthop2cat will keep track of the size of the identified substructures, fix the age of the galaxy according to the local density and fix their size according to the estimated size of the clumps. We thank D. Aubert, E. Thiébaut, R. Teyssier and S. Colombi for inputs, D. Munro for developping yorick, and the povray team for doing the real work! This section is bound to become rapidly obsolete since this implementation is rather crude. 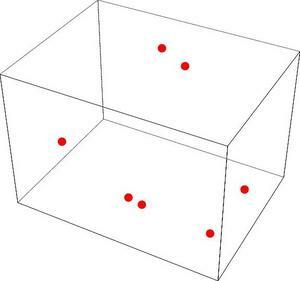 All hyper icons (except for the irregulars) are cubes constructed from analytical profiles. Ellipticals are elliptical 3D cirsic profiles. Spirals are logarithmic spirals with exponential bulge (in ) and Gaussian in . The level of winding is varied together with the size of the bulge and the number of arms. Bar spirals are like spirals except that the inner region does not wind; it always has 2 arms and the departure from winding is controled by some powerlaw. 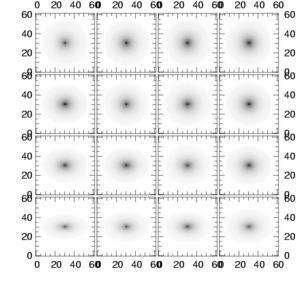 Irregulars are Gaussian random fields required to vanish beyond an elliptical region. 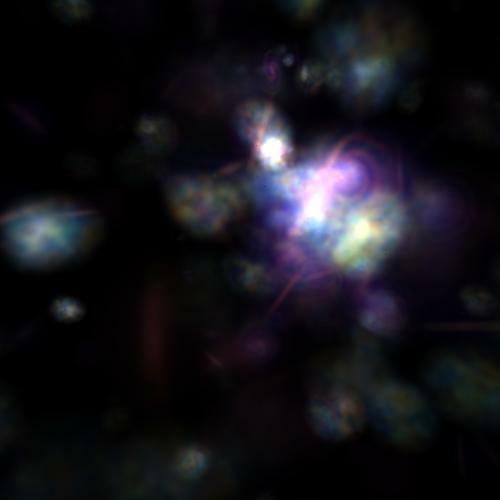 Mergers are extracted from collisions of galaxies carried in Gadget with Magalie as initial conditions. 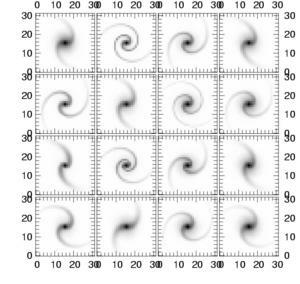 Again the process is rather crude; a elliptical is a mixture of 3 cubes; a spiral and a barred spiral is a mixture of a blue spiral (resp. 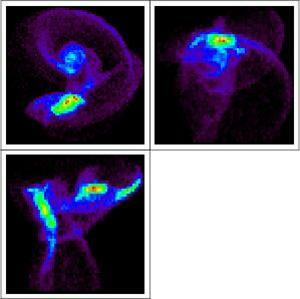 barred spiral) and a red and green S0; the age of the galaxy is coded so that the blue component decreases with age. For the spirals, add external spirals as well as the central one, together with ofset spirals which absorb. Define base colour for the 3 cubes which are not but rather blueish, redish, yellowish so that the 3 components can be varied independantly of colour.